Fill a cocktail Shaker with ice. Add the Juices, Vodka and Cointreau and shake vigorously. Strain into a Martini Glass. Slowly pour the Raspberry Liqueur along the inside side of the glass, until it settles to the bottom. 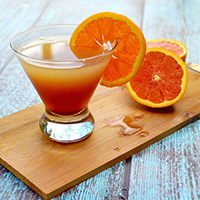 Garnish with an Orange and serve.